In Texas two children, ages 8 and 3, died when a tree fell on a car Saturday afternoon, trapping them inside, Angelina County Sheriff's Department told NBC News. They were pronounced dead at the scene. In West Monroe, Louisiana, a 13-year-old boy drowned in a drainage area in what officials believe was a weather-related incident, said Glen Springfield, spokesman for the Ouachita Parish Sheriff's Office. Several streets had been closed in the city of around 13,000 and a flood warning had been issued for the area, officials said. 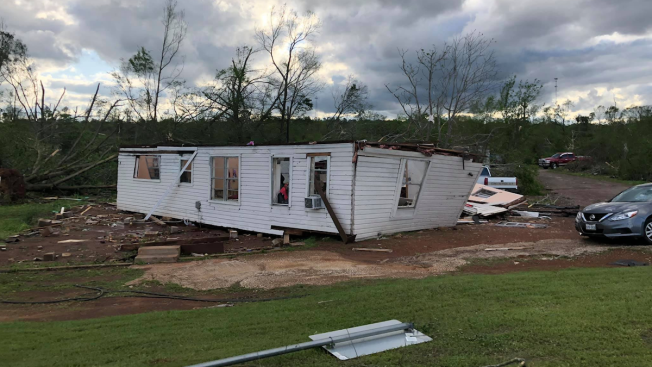 A fourth person who died in the storms was a woman killed by weather-related debris near the community of Weches in Houston County, Texas, the sheriff’s office said.